The Technical University of Ilmenau (TUI) is the initiator of the planned project. The employees of the technical university have the technical know-how regarding remote engineering and remote labs and endue about the technical equipment. 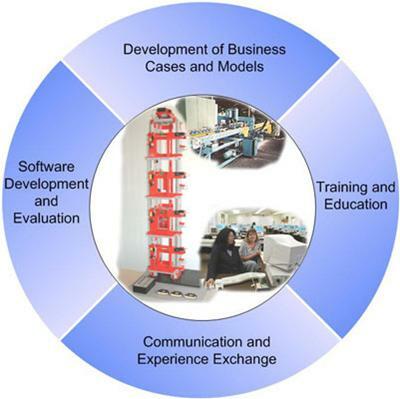 The Carinthia Tech Institute (CTI) completes the knowledge regarding virtual labs. In order to cover the soft factors of the project the TUI decided to integrate the BWAW, a training centre, which is able to communicate knowledge and information. All partners (from Carinthia and Thuringia) tried and try to acquire several institutions for integration into the project, made a first analysis of the current situation and formulated the project goals. Reasons for the selection of the participants: The Technical University of Ilmenau (TUI) acts as project manager, providing the technical resources and background. The employees also endue about project experience and are able to transfer the knowledge to enterprises and other research facilities. The technical spectrum of “remote engineering” is completed by the knowledge, equipment and experience of the Carinthia Tech Institute (CTI) and the Christian Michelsen Research AS (CMR). BWAW Thüringen (BWAW) was integrated because of its project experience and the experience they provide building up networks of SMEs. Additionally, the BWAW provides know-how in arranging learning and teaching processes and in constructing apprenticeships and advanced trainings. REAL has integrate the Christian Michelsen Research AS (CMR) as a partner of Western-Norway for including industry networks like shipping industry or oil and gas industry. A potential partner from Kaunas (Lithuania) can also be integrated in the future. Service as an accomplishment you need to pay for becomes more and more the strategic benefit and an important instrument in competition in mechanical engineering. As more complex the machines and constructions are going to be, as larger the part of the added value will be with respect to service and maintenance. With increasing tendency already 20% of the business volume at mechanical engineering is reached by product related services. Today 40% of the mechanical engineering customers buy a product on basis of the additional product-related services. Engine manufacturers in many industrial sectors have to guarantee fixed repair times independent from the place in the world their product is located. Additionally there is the need to arrange regular inspections and to deliver spare parts (Maintenance, Repair- and Overhaul-services). Today, especially in small and middle enterprises (SME) it is common to send an engineer detecting the kind of the failure. After this spare parts and specialists which are needed can be requested. These services would have been too expensive. By means of services during the whole lifetime of a machine, a producer can stand out from the competition. Remote Engineering allows monitoring machines in a very flexible way, eliminating defects and offering additional control services. Mechanical engineering in Thuringia represents a large range of the economy. In 2002 mechanical engineering was the third-strongest industry in Thuringia according to the number of employees and enterprises. Since 1995 the export in Thuringia has trebled. To keep pace with this development the SMEs of Thuringia’s, Carinthia’s and Norway’s mechanical engineering have to become more service oriented. Furthermore, they have to learn to use new technologies to make their products more attractable. For SMEs in Thuringia, Carinthia and also in Western-Norway it is very important to have access to geographically distant markets/market potential, because their regions are rural minted. This fact means that the enterprises need technological and organizational reorientation and reorganization to save jobs in the region substantially. Many technologies are already available but they are not mellowed for the market. The integration of new technologies partly requires financial investments and investments in the human capital and training. The project members will work based on their specific competences especially concerning the implementation of the laboratory.